We often hear of new books that have a classic feel but The Secret Horses of Briar Hill is truly reminiscent of immortal Children's Books which explore the power and duality of imagination in confined spaces such as The Secret Garden. 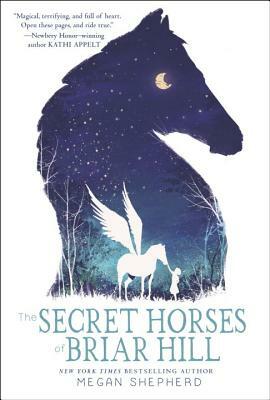 Set in the small, ever shrinking world of a World War II hospital for children with tuberculosis in the British countryside, the story of young Emmaline and her mission to rescue an injured winged horse trapped in the sanatorium's grounds is as deeply moving as it is unforgettable. Described as "reminiscent of the Chronicles of Narnia" in a starred review, The Secret Horses of Briar Hill shows readers everywhere that there is color in our world—they just need to know where to look. There are winged horses that live in the mirrors of Briar Hill hospital—the mirrors that reflect the elegant rooms once home to a princess, now filled with sick children. Only Emmaline can see the creatures. It is her secret. The horse, named Foxfire, is hiding from a dark and sinister force—a Black Horse who hunts by colorless moonlight. If Emmaline is to keep him from finding her new friend, she must surround Foxfire with treasures of brilliant shades. But where can Emmaline find color in a world of gray?